TAKE ADVANTAGE OF OUR SERVICE SPECIALS CALL US TODAY! PROMO: TOWABLE-01 *Pricing does not include taxes, shop supplies or applicable fees. Includes wheel seals and brake cleaning fluid. Disk brakes are $99 additional. 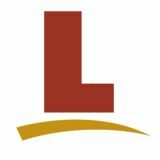 *Pricing does not include taxes, shop supplies or any applicable fees. *For Pre-wired RV, or additional labor will be required. Part# (White) 48203C969 (Black) 9430D7153. Pricing does not include taxes, shop supplies or any applicable fees. Visit Our Knoxville Location Today! DID YOU KNOW? THE RUBBER-LIKE SEALANT AROUND ROOFTOP OBJECTS AND SEAMS STRETCHES OVER TIME CAUSING VOIDS THAT ALLOW WATER TO ENTER THE ROOF LINE. APPLIANCE BURN CHAMBERS SHOULD BE CLEANED OUT EVERY 12 MONTHS. THE FIBERS IN GENERATOR AIR, FUEL & OIL FILTERS BREAK DOWN EVERY 12 MONTHS. THE RECOMMENDED SERVICE LIFE OF A CO OR LP GAS ALARM IS 5 YEARS. TEST YOUR ALARMS AND REPLACE THE BATTERIES REGULARLY. AC COILS SHOULD BE CLEANED TO HELP PREVENT DEBRIS AND BUILDUP, WHICH IF LEFT, WILL NEGATIVELY IMPACT THE QUALITY OF AIR AND BOG DOWN THE AC SYSTEM. BATTERY POSTS AND TERMINALS SHOULD BE CLEANED EVERY 12 MONTHS. FLUID LEVELS IN WET BATTERY CELLS SHOULD BE TOPPED OFF EVERY 30 DAYS. THE AQUA-HOT NOZZLE AND FUEL FILTER SHOULD BE REPLACED EVERY 12 MONTHS. THE AIR DRYER IN DIESEL MOTORHOMES SHOULD BE INSPECTED EVERY 12 MONTHS TO ENSURE IT IS STILL PROTECTING THE AIR SYSTEM FROM MOISTURE. LED BULBS OUTPUT MORE LIGHT WHILE USING EVEN LESS ELECTRICITY. THEY ALSO PUT OUT LESS HEAT AND LAST MUCH LONGER THAN STANDARD BULBS. MOTORHOME TIRES should be rotated every 12 months. It is also important to maintain proper inflation of trailer and motorhome tires. Converting to NITROGEN in tires can increase tire life by 30% or more and it also provides the benefit of maintaining tire pressure 3-4 times longer than oxygen. ROOFTOP & BODY sealant should be inspected every 3 months for deterioration. SLIDE GASKETS should be conditioned every 3-4 months to maintain their pliability for proper flipping and sealing off of sliderooms. SLIDE TOPPERS provide sliderooms protection from water and debris intrusion as well as protecting the gaskets from sun damage. SAFETY GUIDELINES Safety is a major concern at Lazydays. We want you to have a pleasant and enjoyable stay at our facility, but also one that is accident free. We ask that you and your guests â&#x20AC;&#x201C; especially children â&#x20AC;&#x201C; follow the guidelines below to assure everyoneâ&#x20AC;&#x2122;s safety while you are at Lazydays. Due to fire codes and insurance regulations, visitors are prohibited from entering any service bays. 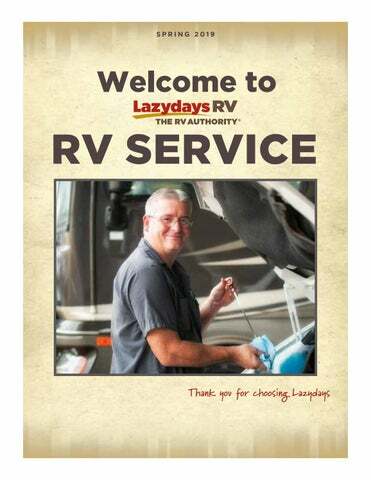 If you need access to your RV during working hours, please see your Service Advisor for assistance. Parking any vehicle in front of a service bay is strictly prohibited. Parking in this restricted area creates a safety hazard as this is a fire lane. Please park your tow vehicle in front of the main building when your RV is in a service bay. Smoking is not permitted at any time inside any building. Designated smoking areas are available and are clearly marked for your convenience. Patio chairs and gas grills are prohibited in or near the service bays. Please do not ride bikes, skateboards, go-karts, motorized wheelchairs/scooters, etc. in any of the work areas or on the street. Bikes may be used on the sidewalks going to and from. Please keep pets leashed at all times. Always inform your technician if your pet is in your RV. Do not leave pets unattended in your RV without air conditioning and water. Please comply with posted speed limits throughout the dealership. When operating personal motorized equipment, please do so at a reasonable speed.